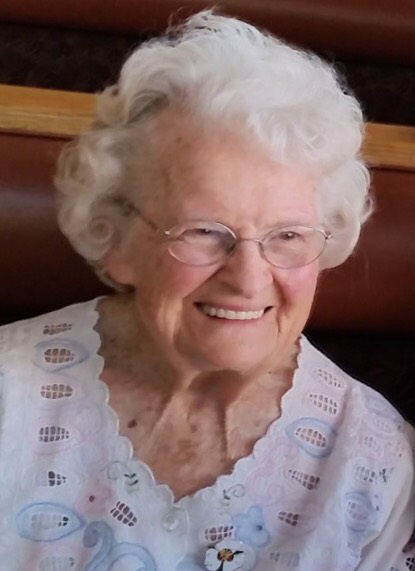 Grace Cleora Wright Maxfield Bills, 98, passed away at her home in Paul, Idaho, on Sunday, April 7, 2019, after a brief illness. .
Cleora was born to parents Clarence Charles and Grace Phylinda Newell Wright on Dec. 27, 1920, at her family home in Lindon, Utah. Funeral services will be held 1:00 p.m. Saturday, April 13, 2019 at the Paul 1st Ward Church of Jesus Christ of Latter-Day Saints. Viewing for family and friends will be held for one hour prior to the services at the church. Services will conclude with burial in the Paul Cemetery under the direction of Joel Heward Hansen Mortuary. she grew up on the family fruit and dairy farm in Lindon, before marrying her childhood sweetheart, Merrill Ward Maxfield on Oct. 29, 1942, in the Manti LDS Temple. The couple lived in Maine during WWII, where eldest son Jae M was born. Upon returning to farm in Lindon, four more sons were born: Newell K, Ward M, Kim C and Gerald “Jerry” A. As an Army veteran, Merrill qualified for the Homestead draw, and the family moved near Paul, Idaho, to farm in 1958. After Merrill passed away on Jan. 28, 1978, Cleora served an LDS mission in San Bernadino, Calif.
On Dec. 9, 1988, Cleora married Noel Bills in the Boise LDS Temple, and she welcomed his children, Lane, Mark and Irene, and their children into the family. Cleora and Noel enjoyed 17 years together, serving at the Family History Library and traveling, until Noel’s death on Aug. 16, 2006.